An email from a friend caused a chain of events that led me to a wonderful paper by Charles Kerfoot, about resurrecting fossil eggs from progressively deeper and older layers of sediment in a lake, and hatching the eggs from different layers to compare the creatures (Daphnia retrocurva) as they evolve over time. As these eggs are covered in sediment, they remain dormant (in facultative diapause) for as long as 300 years or more (the paper only shows data going back to 1825). In lakes that freeze over, sediments arrange in annual layers called varves. They can be counted like tree rings. In addition to counting the annual layers, the sediments were also dated by Cesium, Potassium, Radium, and Lead radio-dating, which confirmed the dates done by counting. The eggs from different layers were hatched, and the Daphnia (water fleas) that grew from them show differences in the body armor over time as they adapted to evolving predators. Genetic analysis also shows evolution, both in mitochondrial DNA, and in allozyme analysis, where enzymes that differ only in their amino acid sequence show where specific mutations in a gene have ocurred. By tracking the mutations as they accumulate in successive generations, further confirmation of the date sequences and evolutionary change becomes visible. 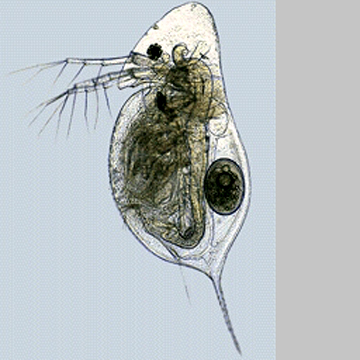 Other eggs and fossil remains show how the predators of Daphnia evolve to keep up with defensive adaptations by their prey. By hatching dormant eggs from sediments laid down over hundreds of years, we can watch evolution progress right in front of our eyes, in a complex crustacean, not just in bacteria and viruses.